Kennedy Space Center Packages use code LPKS. Bed and Breakfast rates use Package code LPK1. The Ramada Kennedy Space Center is located 13 miles from Kennedy Space Center off of I-95 and exit 215. The Ramada Kennedy Space Center is minutes from Playalinda Beach and Cocoa Beach. Other attractions near this hotel include Port Canaveral Cruise Port, Patrick Air Force Base, Astronaut Hall of Fame and Cocoa Expo all within a short driving distance. 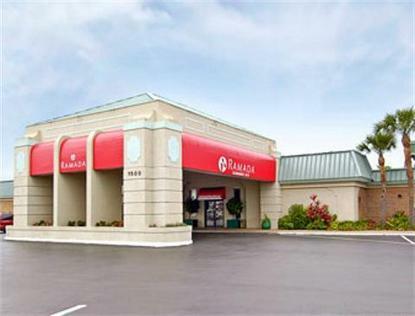 The Ramada Kennedy Space features standard amenities such as Sealy Plush beds, Free High Speed Wireless Internet Access and an Outdoor Heated Pool, Jacuzzi and Sundeck. The hotel also has a Dennys Restaurant, Remedy Sports Lounge and Meeting/Banquet space available at this location. Kennedy Space Center Package (2 night min) use code LPKS. Bed and Breakfast rates use Package code LPK1. To reserve click the CHANGE button to create a new search and input promo code.